The GUAM establishment was on 10 October 1997 during the Second Council of Europe Summit in Strasbourg. The Heads of State of Georgia, Ukraine, Azerbaijan and Moldova adopted the Joint Communiqué of the Heads of State which was stressed the need for the development of quadrilateral cooperation for strengthening stability and security in Europe based on respect for the principles of national sovereignty, territorial integrity, inviolability of state borders, democracy, the supremacy of law and human rights. The first letters of the countries’ names formed the abbreviation GUAM as the name of a new international association of states. Strasbourg Communiqué consolidated formally a gradual political rapprochement and practical deepening of cooperation between countries both at the international and bilateral levels. The establishment of the Association was based on the intention of the GUAM countries developed effective cooperation, restored economic ties and strengthened friendly relations. On April 24, 1999, the meeting of the GUAM Presidents and Uzbekistan took place during the high-level meeting of the Euro-Atlantic Partnership Council in Washington. The Association after the accession of Uzbekistan was transformed into the GUUAM. In 2002, Uzbekistan announced the suspension of its participation, and in 2005 – the withdrawal from the Association. In connection with the withdrawal of Uzbekistan from the GUUAM, participants agreed in the future to call its the GUAM. On November 6, 2000, the meeting of the GUUAM Presidents held during the 55th session of the UN General Assembly in New York resulted in the adoption of the New York Memorandum given the GUUAM cooperation a multi-level nature. The Presidents decided to hold regular Summits of Heads of State and meetings of the GUUAM Foreign Ministers, as well as to create a working body – the Committee of National Coordinators. On June 7, 2001, the Heads of the Participating States signed the Yalta Charter which defines the goals, principles and main cooperation’s directions. The adoption of the Charter was the first step on the way of the GUUAM institutional formation and laid the process of its transformation into a full-fledged international organization. The signed by the GUAM documents provided the political, legal and organizational basis for overcoming challenges from international terrorism, separatism and extremism and created the legal framework for comprehensive cooperation. In this context, it was become very important ensuring the further effective functioning of the Europe-Caucasus-Asia transport corridor, signing of the Agreement on the establishment of Free Trade Area and the establishment of the GUUAM Business Council. Expansion of the legal functioning of the organization is accompanied by the intensification of the activities of the sectoral Working Groups, the development of cooperation in the customs and border areas, the prevention and elimination of the consequences of emergencies etc. In 2004, the GUAM Parliamentary Assembly was established in Kyiv designed to provide legislative support to the Association’s projects of cooperation, harmonization of domestic legislation, bringing it in line with international standards. The Chisinau Summit of the GUAM Heads of State (April 22, 2005) witnessed the unity of its participants’ views on the processes of European integration, the democratization, economic development, stability and security in the region. On May 23, 2006, the Kyiv Summit was held with the participation of the Presidents of the Republic of Azerbaijan, Georgia, the Republic of Moldova and Ukraine. The Presidents of Lithuania and Poland, the Vice-President of Bulgaria, high-level representatives of Romania, Kazakhstan, the United States, as well as international organizations, in particular the OSCE and the BSEC, and diplomatic missions took part in the Summit. 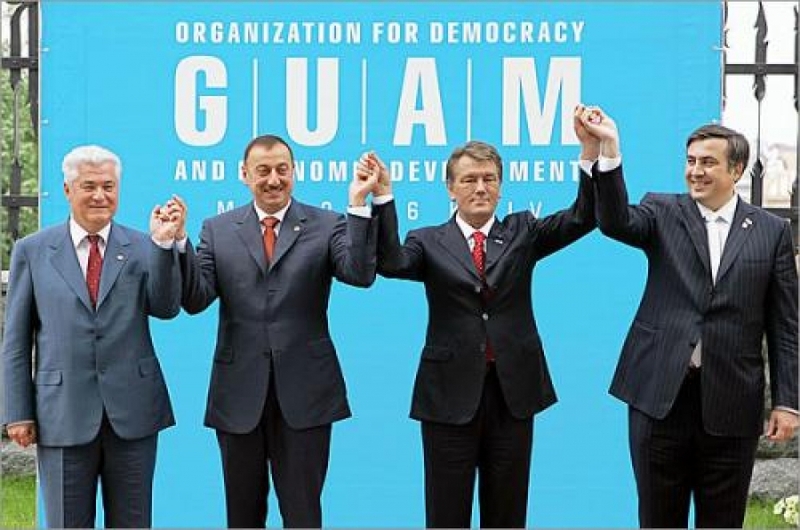 In pursuance of the decisions taken at the Chisinau Summit, the GUAM Heads of State announced the creation of the Organization for Democracy and Economic Development – GUAM and signed its Charter. The priorities of the Organization are strengthening of democracy; ensuring the supremacy of law, human rights and fundamental freedoms, stability and security in the region; combating international terrorism, separatism, extremism; deepening the European integration; achieving sustainable development and improving the welfare of states. The Heads of States noted that the GUAM is an open organization to which any state can join sharing its goals and principles. In order to develop cooperation with interested countries and international organizations, they approved the Decision on Partnership.